Before I continue, I must thank our cousin -- GO3 -- for a couple of the photos here. I must be too used to doing macro shots that I've forgotten how to take regular pictures of larger-than-a-plate sized objects! Or, I actually just do not know how to use a camera. Of course, it didn't help that it was quite dark inside the mosque, not to mention that there was the overwhelming smell of feet. But, I'm getting ahead of myself. 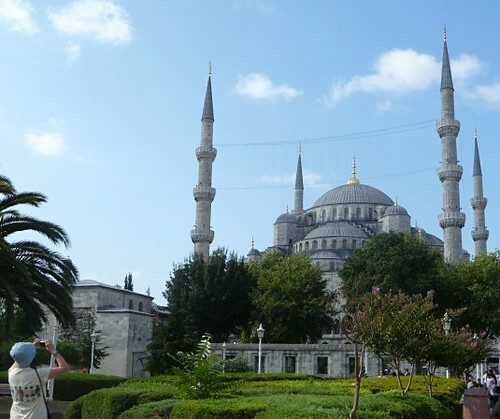 View of the Blue Mosque on a sunny day. Only four minarets showing here. There are six. As you can see, it was raining. We first went to the Blue Mosque the day before, when it was nice and bright. We caught the tail end of a three-day holiday in Turkey and perhaps because of that, there weren't many "Western" tourists. The visitors seemed to be "local" to my untrained eye and ears. Being a working mosque, shoes are not allowed inside. For the locals, this was nothing unusual. We and the other visitors were shoeless inside the mosque, necks craned up, with me trying to take usable pictures of the interior. 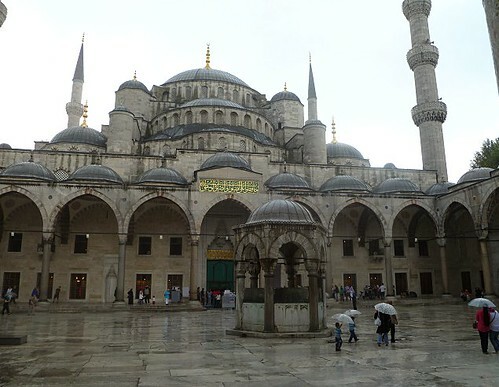 The following rainy day, we officially joined a tour which included a visit to the Blue Mosque. 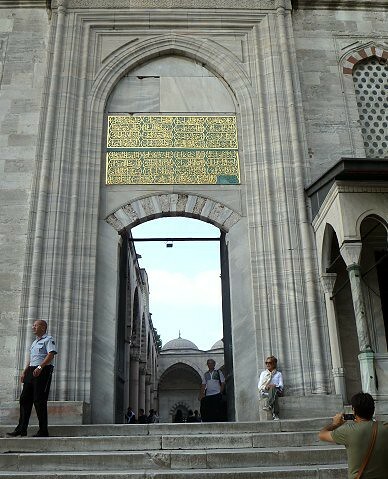 So, we thought we'd just enter the mosque again. On this day, however, there were more people, and more "Western" tourists. They really seemed to be having a hard time donning off their shoes (and putting them back on at the end of the visit). 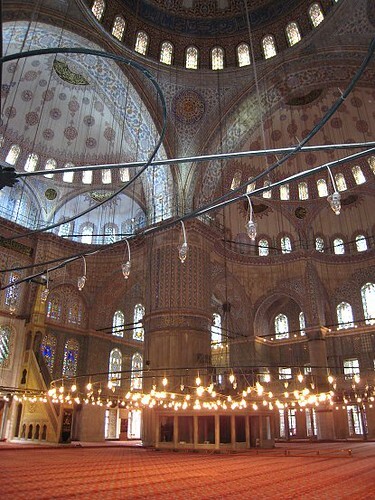 Upon entering the mosque this time around, I felt stifled from the heat of all the bodies inside. More disturbingly, the overwhelming smell of feet that I previously mentioned, well, overwhelmed me. I had to get out! Good thing I already visited the mosque the day before. 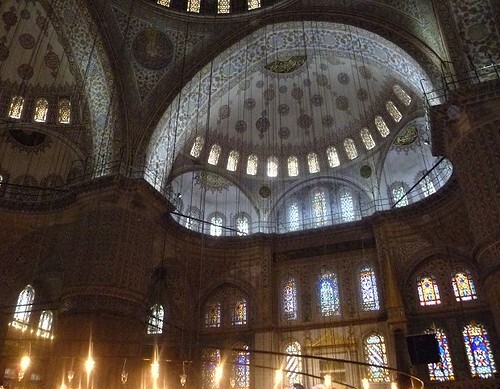 Oh, why is the Sultanahmet Mosque nicknamed the Blue Mosque? Blue tiles line (mostly the upper levels of) the interior walls. Still a little puzzling, though, this moniker, as the interior doesn't really scream "blue" at all. 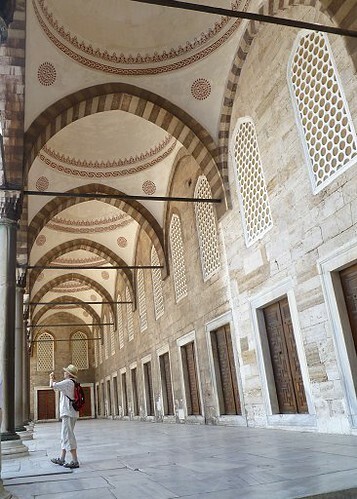 Coincidentally enough, I chanced about Martha Stewart's Istanbul Show videos on her website! There's a short description, as well as a video of her visit. That's a nice looking mosque! 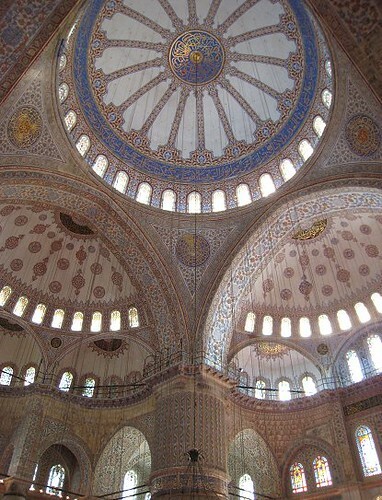 The interior domes remind me of some cathedrals that we've visited. Do you know how old is it? It was built in the early 1600s. The part that was open to visitors was actually small. I don't know why it looks so big/what the other parts of the structure are used for. It is beautiful! That is too funny about the feet! 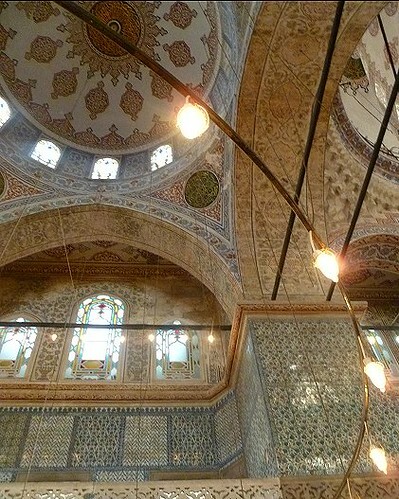 Beautiful mosque. It makes me chuckle about the feet smell.